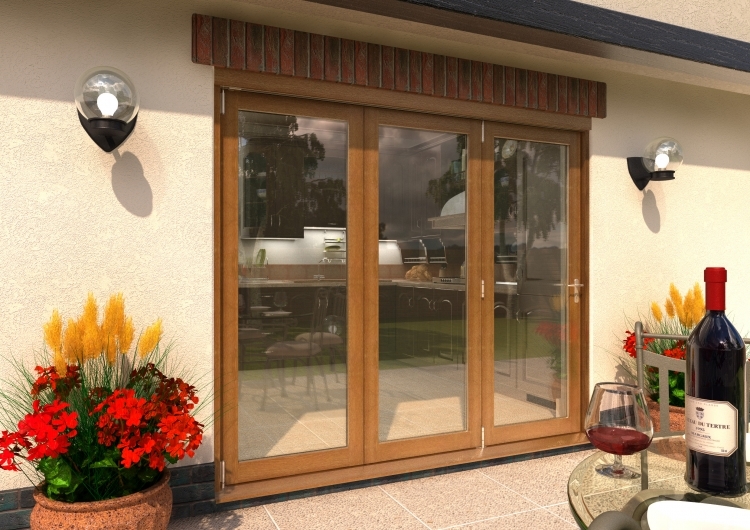 Do you think that sound oak bi fold doors cost the earth? Think again! The Climadoor range of solid oak bifolding sliding patio doors provides you with a premium product at an unbeatable price! The Climadoor range of sliding and bifolding patio doors are double glazed for the ultimate thermal performance. With a center pane U value of 1.1W/m2K, you can sit back and lap up the view knowing that your heating bills are being minimised. Finished with a lightly tinted, long-lasting lacquer these doors are thermally efficient, and they also look amazing! The top hung system also ensures that you simply enjoy the smoothest opening and closure functionality you have seen. With Guaranteed By Design approved running gear as standard and a multi -point locking system, this set offers satisfaction for those conscious of the security of their bifold doors. You really won’t find a better set of solid oak doors for a much better price anywhere, so why wait? Select your size now and purchase! As with our doors, the Climadoor 58mm supreme solid bifolding door includes a guarantee against manufacturing errors as standard. Find out more here. We're proud to confirm that we're easily accessible to support and assist you at any point during your Vibrant Doors experience. We're here to help you and make sure that you purchase the right merchandise from us, so we now have designed the site to ensure that each detail you need is readily visible, accessible and presented in an understandable way. At Vibrant Doors we're experts and understand the higher level of service and range of products our customers desire. We meet and exceed your demands by producing a fantastic selection of products, the fastest delivery time in the marketplace and the best prices. We have been committed to attaining high degrees of customer satisfaction and delivering you the entire bundle.